Ingenious creations, Zanzibar pepper and salt bars offer an unparalleled taste experience. They invite you on a journey to the heart of the richness and diversity of the world’s salts and peppers. 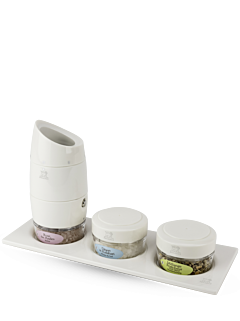 Delicately positioned on a plate and accompanied by an exclusive selection of three excellent salts or peppers (from among a large collection of eight salts and peppers) as well as a recipe book, Zanzibar feature a detachable and interchangeable reservoir. Equipped with the patented u’Select grinding control system, these mills proudly put into practice all of Peugeot’s historical artisanal expertise and ingenuity. Genuine salt or pepper bars, Zanzibar are an invitation to embark on an unparalleled journey, along the world’s salt and pepper trails.